I was pretty sure I had read every book Diana Wynne Jones had written. Over the course of a summer, during my formidable years, I read everything by her that I could get my hands on. 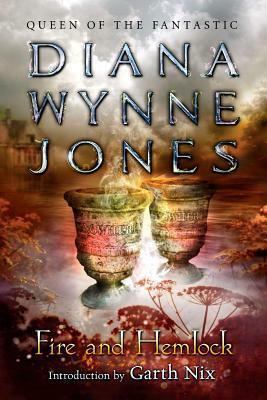 Image my surprise when, while obsessively organizing my Goodreads shelves, I stumbled across Fire and Hemlock a Diana Wynne Jones book I had missed! I dashed to my local library and the rest is reading history. The heroine in this novel is Polly. Polly has two sets of memories, the normal everyday memories of her parents divorce and her childhood. The other set involves Thomas Lynn and a fantastic world of made-up stories and curses. It took me a while to get in to the story. The novel begins with Polly packing for college but quickly shifts to when she was ten years old and crashed a funeral. This funeral crashing led to her chance meeting with Mr. Lynn. Much of the novel was Polly recounting the childhood memories she thought she had forgotten. During the last fifty pages the story returns to Polly at college and she is trying to figure out how she forgot about Mr. Lynn. Needless to say, there was a lot of buildup for the ending but because much of the novel was buildup I found the ending to be rushed. I also found the relationship between Mr. Lynn and Polly kind of strange. There wasn’t anything untoward about it. But given the fact that Polly met Mr. Lynn when she was ten and he was a divorcee quite a few years her senior, it felt weird even if it was really just Polly crushing on Mr. Lynn and Mr. Lynn being kind. Overall, Fire and Hemlock was well written and had that signature Diana Wynne Jones magic. But the slow beginning and the rushed ending made the story feel a little lopsided. This was a good story but not my favorite from Ms. Wynne-Jones.